1. 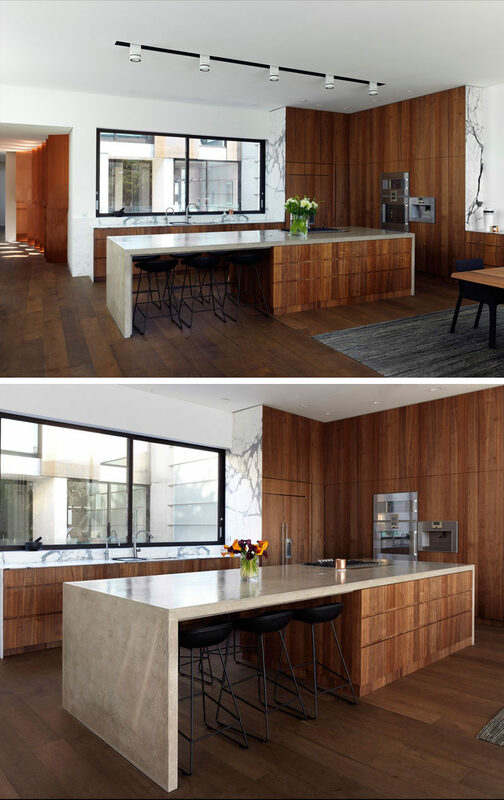 In this kitchen, dark wood cabinets have been combined with a light stone countertop to create a contemporary appearance, while large windows above the kitchen sink provide views of the courtyard. See more photos of this project, here. Designed by Rolf Ockert Design. Photography by Luke Butterly. 2. In this modern house, light wood stairs lead up to the second floor of the home, and a vertical wood accent wall with hidden lighting helps to emphasize the height of the foyer. 3. South Korean designer Jiyoun Kim has created the Dokkaebi Stools, a collection of 24 mirrored stainless steel stools with each a painted seat, that will grace the Hangang Art Park in Seoul. See more photos of this project, here. Designed by Jiyoun Kim. 4. 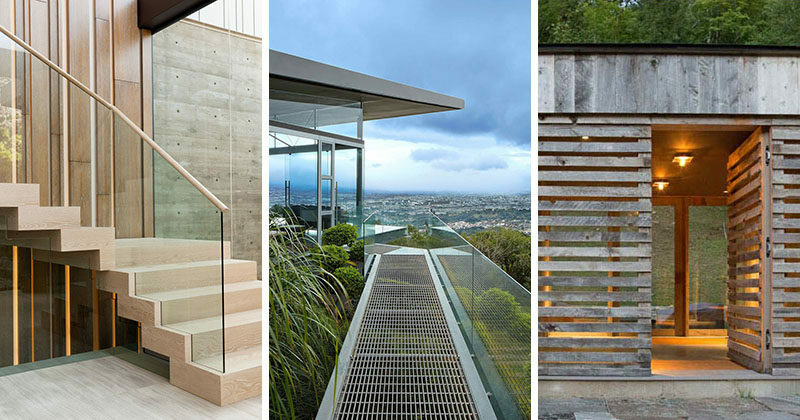 The entrance to this entertaining room is accessed by a raised steel path with a glass safety railing and at night the path is lit up. See more photos of this project, here. Designed by Cañas Arquitectos. Photography by Jordi Miralles. 5. This modern house is clad in a siding composed of re-purposed snow fencing, so that it already has the natural beauty of the weathered boards. The front entrance is hidden away within the siding, making it almost invisible when walking past, with only a small stone path telling you where it is. See more photos of this project, here. Designed by Birdseye Design. Photography by Jim Westphalen.